Thirty Minute Thoughts: I Wish The Gator Nation Was At Trinity! I admit it was tough being away from Gainesville today. 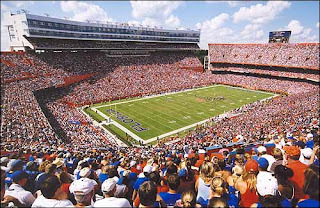 Gameday in Gainesville is an experience I wish so many others could partake in. And tonight I was reminded just how far away from that experience I was. Ryan Fields, a buddy who just moved up here from Gainesville along with me, and a fellow Gator, Kahem, seem to be the only three UF Alumni in this entire area just outside of Chicago. We decided to go to this restaurant/brewery just down the road, thinking we'd be able to watch it on the big screen. Contrary to popular belief, Christians are allowed to go to bars, and are actually able to drink alcohol without melting or disappearing. We saw promise as we walked into the bar area, which was had the capacity and potential to be filled with hundreds of Gator fans for this sweet game. Instead there were five people randomly scattered throughout, two of them playing darts over in the corner. To add to the excitement, the bar had an enormous high def screen front and center for us to enjoy. We sat down at the perfect table thinking that if we just asked them, they would be more than willing to change the channel, which I might add was showing a Cubs game. Building upon all was the surprisingly refreshing, great tasting Harvest Amber Ale I ordered, brewed right in front of us as the brewery was situated behind the big screen we were expecting to watch the Gator game on. The waitress delivered the drinks and took our food order. Right before she walked away one of us said, "Excuse me, but is it possible for us to put the Gator game on the big screen here seeing as how we are the only paying patrons in this entire establishment and they are of course The University of Florida Gators?" It may not have been worded exactly that way, but the response was a death blow: "Ummm...nooo...are you serious? Like the Cubs are playing right now. In fact, we only get one channel for that big screen and it's called 'Cub Station.' Sorry." She went on to say, "But for your convenience we have this 4-inch TV over there in the corner right above those two playing darts that you can watch. Oh, and there's no sound, but it is a flat screen. We try to accommodate all our patrons with the finest service." WHAT??? So it may be a bit of an exaggeration because it was a nice TV, but it sure felt that way. We had to move our seat so we could be closer to the TV, which really was above to dart-playing duo and it really didn't have sound (or closed captioning). The place was dead quiet except for the occasional clapping that came when Alfonso Soriano hit home runs. And worst of all, we felt weird cheering. How does that happen? So we left at halftime. Got back to campus and watched it on a big screen here with sound. It was still rough. The city didn't shut down. People weren't wearing orange and blue around campus. We were able to drive the car and find parking immediately. It was all just wack. But this is my life now. I must take the bad along with the good.